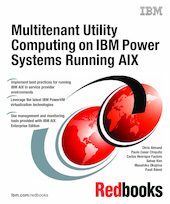 This IBM® Redbooks® publication presents concepts, considerations, and high level deployment examples for technical professionals who design and operate multitenant utility computing environments hosted on IBM System p® and IBM AIX® Enterprise Edition. AIX Enterprise Edition brings together IBM enterprise management capabilities from Power Systems™, IBM AIX, and Tivoli® Software to provide a powerful set of integrated functions for infrastructure management in multitenant utility computing environments. AIX Enterprise Edition brings together several IBM products: AIX 6 operating system, IBM PowerVM Workload Partitions Manager™, Tivoli Application Dependency Discover Manager, Tivoli Monitoring, and IBM Usage and Accounting Manager Virtualization Edition for Power Systems. In addition to these products we also provide a system allocation example using Tivoli Provisioning Manager.